President Obama closed his address on Libya Monday evening with an explanation of what U.S. action in the country "says about the use of America's military power, and America's broader leadership in the world, under my presidency." In other words, he laid out - or attempted to lay out - an Obama Doctrine. And that doctrine, as articulated by the president, is this: The United States can have a moral responsibility to intervene abroad "when our safety is not directly threatened, but our interests and values are." Note the "can." Mr. Obama said there are times maybe U.S. military ought to be deployed even when American citizens do not face a direct threat. And there are also times when it should not be deployed - even when people are being brutalized. How does he decide which is which? In part by weighing the "costs and risks of intervention...against the need for action," as Mr. Obama put it. Sometimes, he said, the costs and risks are high enough - and the U.S. strategic interest low enough - that the U.S. should sit on the sidelines. (Think of Congo, or, it seems, Syria.) But sometimes - when the situation is just right - it means action. "In this particular country - Libya; at this particular moment, we were faced with the prospect of violence on a horrific scale," Mr. Obama said Monday night. "We had a unique ability to stop that violence: an international mandate for action, a broad coalition prepared to join us, the support of Arab countries, and a plea for help from the Libyan people themselves. We also had the ability to stop Gaddafi's forces in their tracks without putting American troops on the ground." Mr. Obama was arguing that the United States had a strong incentive to act in accordance with its morals -- but that it only had an opportunity to do so because of the response of the rest of the world and the relatively low risk for American troops. The president, in other words, said he is neither an interventionist nor an isolationist but rather someone driven by the details of the situation at hand. It's a position that, like others before it, suggests that the president is far more of a one-step-at-a-time pragmatist than the pie-in-the-sky idealist he was widely taken for during his presidential campaign. In Libya, America faced the prospect of "a massacre that would have reverberated across the region and stained the conscience of the world," Mr. Obama said. But that alone was not the reason to act, he added. Even as he put forth lofty rhetoric about how the United States is not the sort of nation that can "turn a blind eye to atrocities in other countries," Mr. Obama suggested there are moments when the United States should do just that. Libya was not one of them, he stated bluntly, because "America has an important strategic interest in preventing Qaddafi from overrunning those who oppose him." Unchecked, Qaddafi's actions could have destabilized the region, he said, shown the UN Security Council to be toothless, and ultimately "have carried a far greater price for America" than military action. The president also linked this approach to his decision to limit the mission to the humanitarian one laid out by the Security Council -- and not use force to achieve regime change. 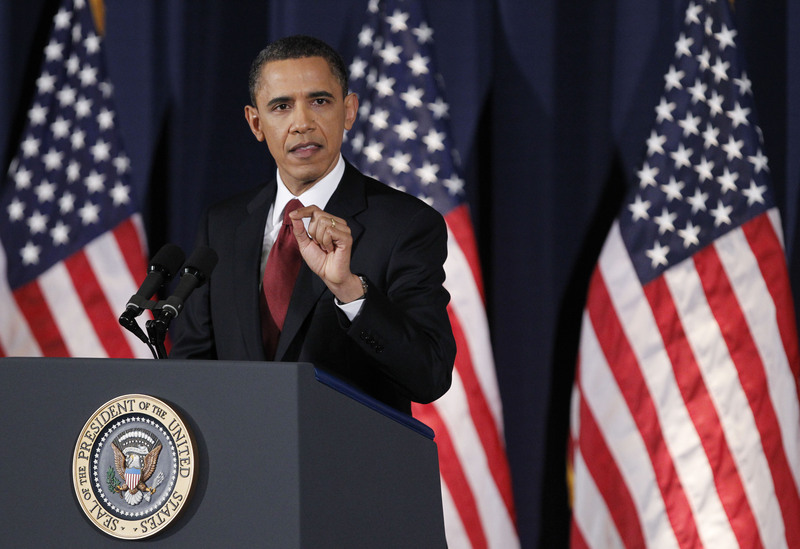 Mr. Obama argued ousting Libyan leader Muammar Qaddafi through force would simply be too costly. "Our coalition would splinter," he said. "We would likely have to put U.S. troops on the ground, or risk killing many civilians from the air. The dangers faced by our men and women in uniform would be far greater. So would the costs, and our share of the responsibility for what comes next." This is where he drew perhaps the greatest distinction with the approach of his predecessor George W. Bush, making specific reference to the situation in Iraq. There, he said, "regime change there took eight years, thousands of American and Iraqi lives, and nearly a trillion dollars." "That is not something we can afford to repeat in Libya," he said. The Obama Doctrine, then, says the United States has a moral imperative to act to stop massacres - but only when the costs are not too high. That's not a position that lends itself to slogans, and it's not one that is likely to placate critics on the left or right. But it is the closest he's come to an explanation of his thinking - and, perhaps, a guide to how he will deal with foreign policy crises that come along down the road.